One of these things is not like the other, one of these things just doesn't belong. (Remember that song from Sesame Street?) Can you find the thing that does not belong? Here's one a little closer. I'm gonna say the fruit. There's no place for healthy food in a fridge!! It's not the penguin...that's too obvious. Did Brooklyn put that in there? 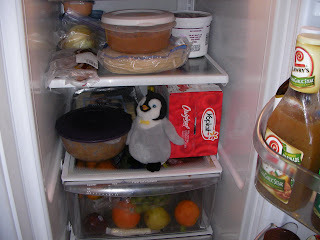 I knew she liked to steal Jake's one and only penguin, but I didn't know she'd try to hide it in your fridge?! 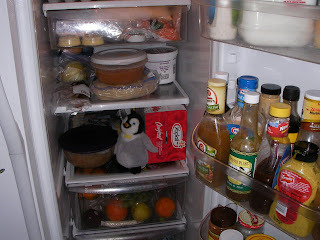 That joke is really funny.I knew it was the penguin because it's not any kind of a food.And by the way thank you for giving me stuff to write about in my blog.